According some studies made in Middle East, chillers use over 40 % of all the energy in industrial and commercial space cooling. Therefore, it is understandable that designers are concerned about chiller efficiency. Several factors — poor maintenance, poor operation, improper sizing, etc affect this efficiency—. Stakeholders in the industry know that anything that improves any aspect of chiller efficiency can have a massive impact. Having said that, what is the role of standards in the plants? As new standards emerge, chiller efficiency is becoming increasingly important. Currently, two main organizations deal with certification programs namely ARI (Air-Conditioning & Refrigeration Institute) and Eurovent. Focusing on ARI, one of the most notable standards to come from them is Non-standard Part Load Value (NPLV) rating. It is not a new standard considering it first emerged in 1988. However, the rating stands tall among the new ones because of its continual improvement for broader scope and more accuracy. The basic definition of this rating is a measure of part-load performance of a chiller based on the ARI Standard 550/590 – 1998 calculation method. Earlier, there were two standards (ARI Standard 550–1992 and ARI Standard 590–1992), which have now been merged. Part load efficiency of load points of 100 %, 75 %, 50 % and 25 % is used to get a weighted average. Fig 1 demonstrates these figures. – The % of operating hours of the chiller at different loads. – The different ambient conditions that will affect the Entering Water Temperature. It is important to highlight that when the chiller is not working at partial is when ambient conditions are less severe than the design conditions; so the EWT is also lower. There are three possible parameters of NPLV rating namely energy-efficiency rating (EER), kilowatt per ton refrigeration (kW/TR) and coefficient of performance (COP). For the purpose of this discussion, we will use kW/TR. Moving on, NPLV rating calculation is based on four operating conditions with each of these having a “EWT” and “% Load”. The considered EWT are a result of weather data collected over a span of 25 years in 29 U.S. cities. Experts have concurred of the acceptability of the average data picked from the US cities. According to ARI Standard 550/590-2003, the derivation of NPLV rating considered only single chiller plants. Can this measurement apply for multiple-chiller plants too? The answer is YES. Single chillers and multiple chillers have different loading patterns. When looking at impact on efficiency of a plant, two factors are prominent: head and load. The head, being weather-driven, has the highest impact while the load has minimal impact. Since the weather is common for all the chillers, we can safely say that NPLV rating can apply for multiple chiller plants too. In other words, you can get an accurate rating by dividing the sums of kWs and chiller TR. Managers in district cooling plants have the tough choice of either maintaining or replacing a chiller based on its performance. Chilled water plants are expensive installations. A chiller will last for at least 15 years, meaning that a facility manager will have to live with his or her decision for a long time. There is simply no room for error. The slightest difference even in models can have a huge impact on annual energy demand for a chilled water plant. The manager should therefore have as much information as possible to make the right decisions. The improvement of the NPLV rating will change chilled water plant designs. Failing to meet this standard may mark the end of many chillers and installation of newer ones that meet clients’ expectations. Yes, the adoption and eventual application of this rating may take a while, but the industry is definitely moving towards this direction. 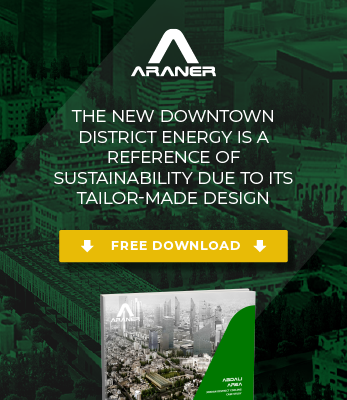 ARANER is a leader in the implementation of advanced refrigeration systems. Achieving the expected efficiency standards for our clients is one of our main aims. If you are interested in one of our solutions, contact us and we will be glad to help you.